There are many reasons for people to provide Sample Reference Check Templates. If you want to give the addresses of your friends or relatives, you should be careful in providing details. The persons have to be in very good position and they should be present, when the inspecting executive visits. The purpose of the referral check is to ensure that you are a very responsible and honest person, with good qualities.Your purpose may not be fulfilled, if your referral results are not good. You should choose only the persons, who are very closely associated with you, especially, when you provide reference names and addresses. 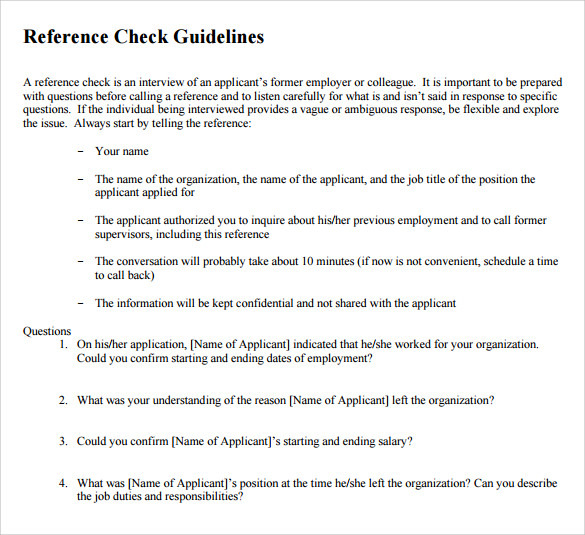 This sample reference check template, as the name suggests, is a template for checking the references provided by any job candidate. It states the various types of responses that is received on a reference check- no comment, factual information, ‘900’ numbers (computer generated information). It also states certain features of reference checks, which are defamation of character, qualified privilege, negligent hiring. 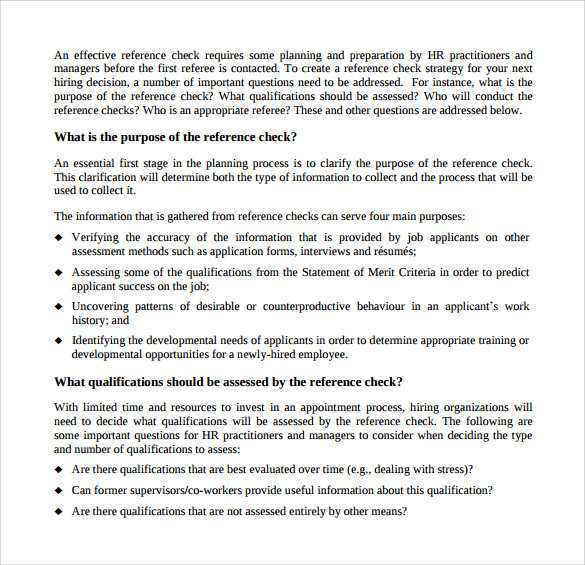 This download reference check template, as the name suggests, is a template for checking the references provided by a job candidate, which is downloadable. 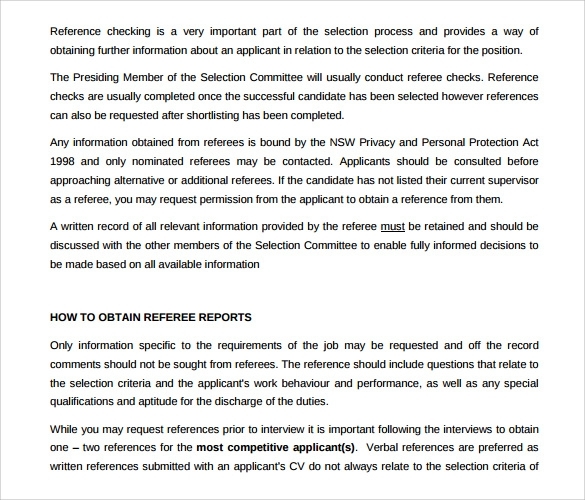 It states the importance of reference check templates, and goes on to state how to obtain referee reports. 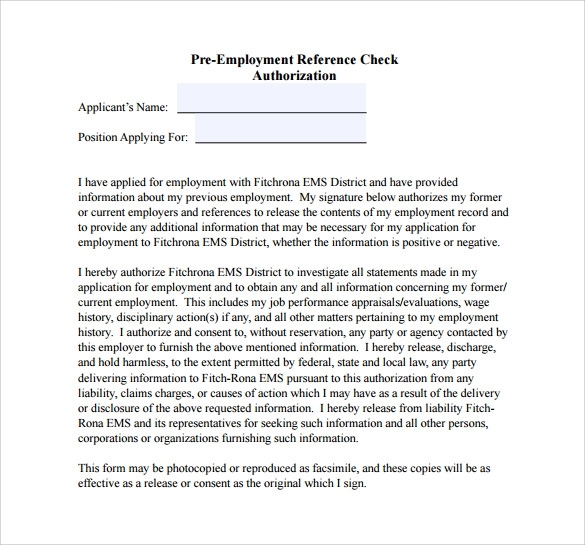 This blank reference check template as the name suggests, is a template for checking the reference provided by a job candidate, which has been left blank, to be filled in by the person who receives this template, i.e. the former employer of the candidate (usually). 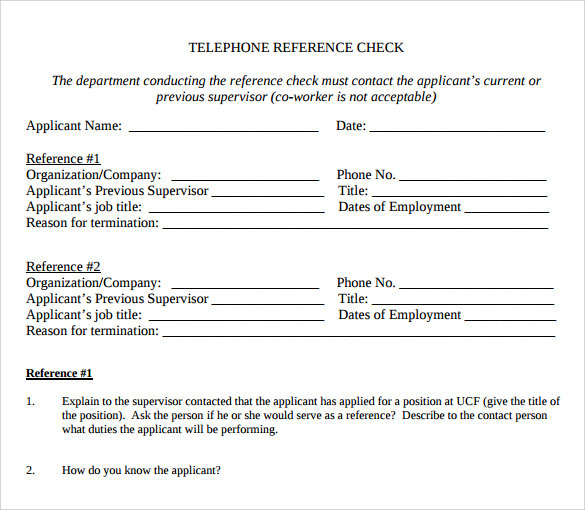 It includes the position for which the reference check is being made, name of candidate, date, reference name, reference phone number, reference email ID, relationship of the reference with the candidate, dates of the candidate’s employment, candidate’s job title or duties, would the candidate be re-employed in case of a suitable opening, etc. 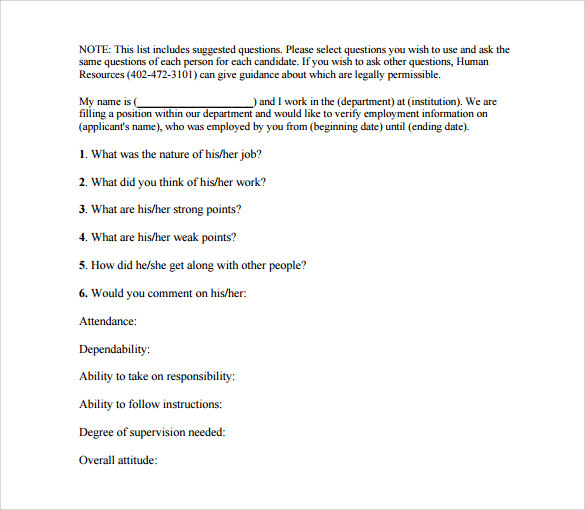 This employee reference check form, as the name suggests, is a template for checking the references provided by a job candidate, in the shape of a form. 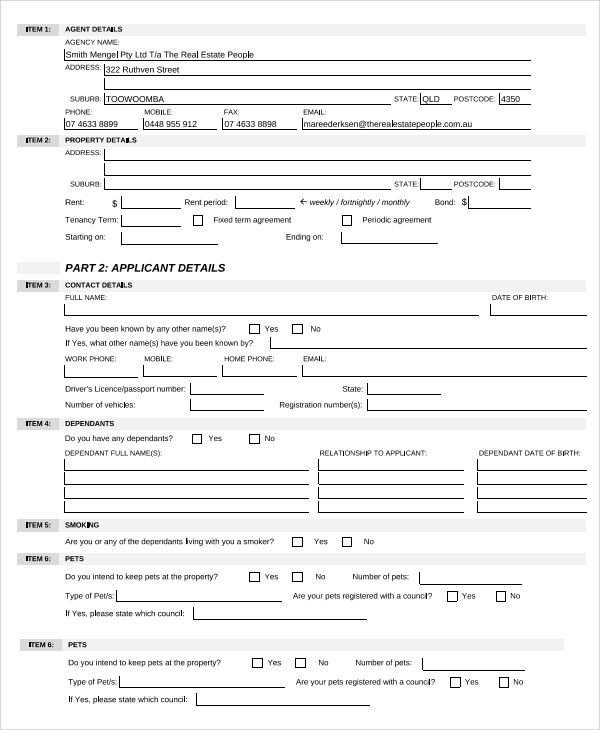 It includes slots for name of the applicant, name of the person contacted, name of the company, position / title, phone number, relationship to applicant, duration since the last conversation with the applicant, dates of the applicant’s employment under you, the nature of his / her job, etc. What Are Reference Check Templates? 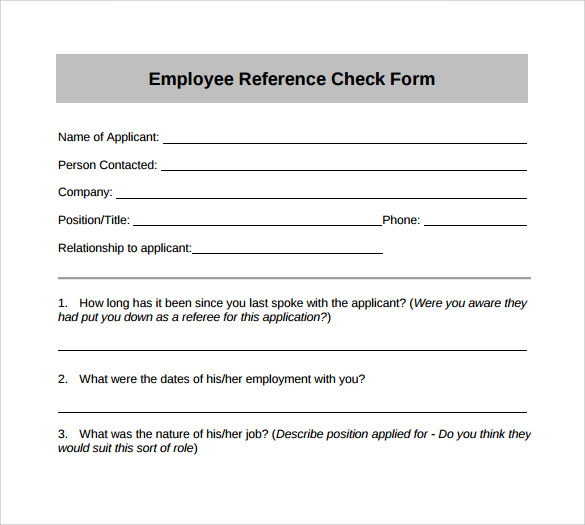 Reference Check Templates refers to the process of contacting the previous employers of an individual who has applied for an opening in your company, so as to determine his job profile, work history, office reputation and workplace relationships. Reference checks can also include verifying the educational qualification of an individual, by checking with the school and college the candidate claims to have attended. 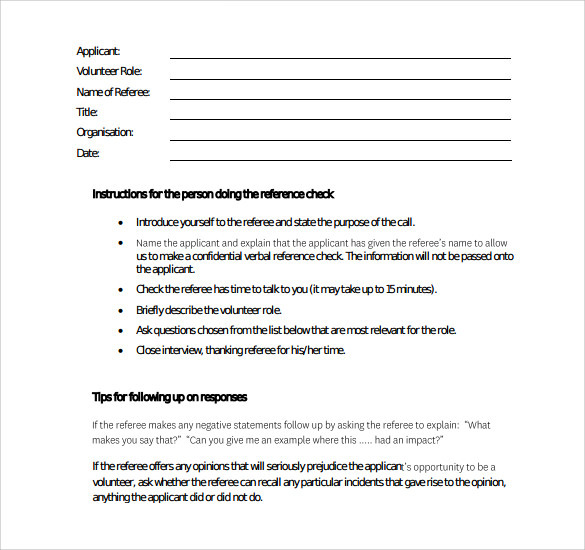 A reference check template helps with the same. It helps in gaining an insight into the history of an individual so as to make an informed decision of whether or not to hire him / her. 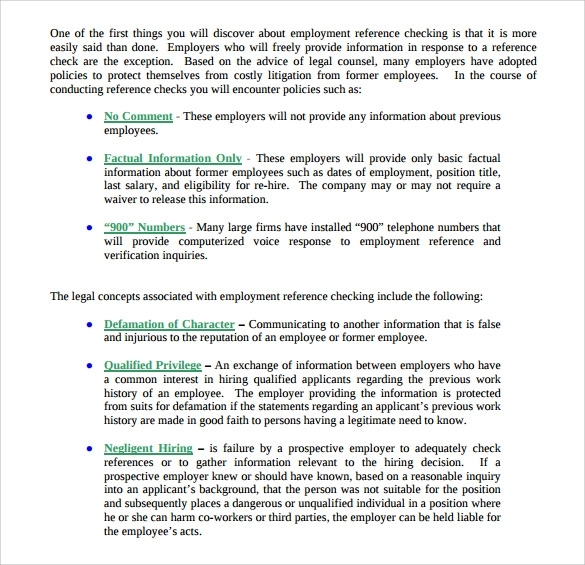 What Are The Benefits Of Reference Check Templates? Qualification-A reference check helps in verifying the educational qualifications of the candidate. Verbal reference checks- Verbal reference checks are much more effective because lying over texts is very easy. One should conduct at least 2 verbal checks. Planning- One must carefully plan the questions, without being too direct. Hypothetical questions- Hypothetical questions are allowed as long as they are relevant, and plausible. Fake- One must take proper caution and identify fake referees. Reference check templates are complicated. One must keep in mind a lot of things, what to ask, what not to ask, how to ask, etc. So we bring you a collection of some of the finest reference check templates to choose from, that will surely satisfy your needs.